Anyway, one of the girls I work with suggested “that new place down the lane”. So, we’re in Melbourne, the laneway capital – that’s not very specific, or helpful! We begged her for more information. “You know, with the yellow awning.” Well, no – we didn’t… but now we were intrigued. We all traipsed down and got a coffee. They use Allpress coffee (which is how our NZ friend knew about it) and our coffees were smooth and luscious. Mental notes were made by all to come back and try out the food, because it looked both cheap and delicious. (By the way, we can all vouch for the $1 choc chip cookies here as well – chewy and chocolatey goodness!) Finally I put that thought into motion last week and headed down for lunch with a friend. They don’t really have a menu as such…or more than about 10 seats around a communal table. But what they do have is really nice staff that will stand patiently next to the case and explain the food options. 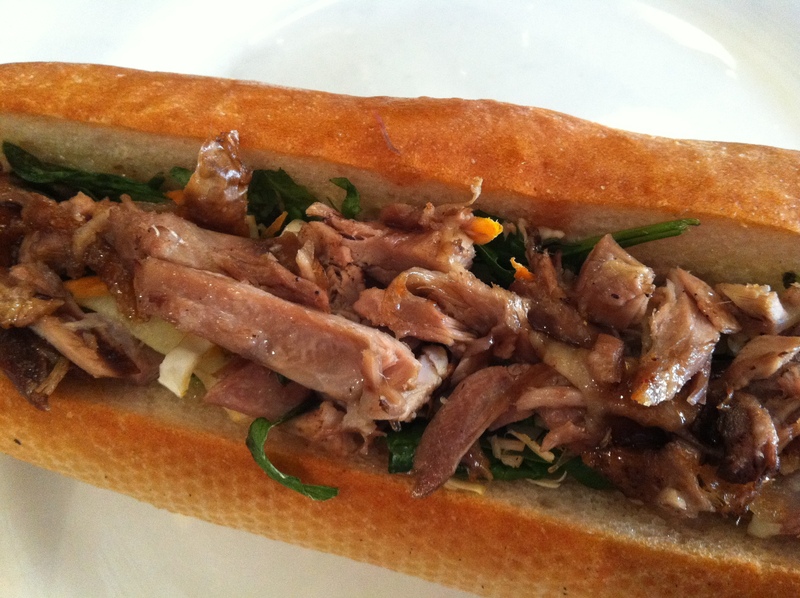 He started with the best, though, because as soon as I heard the words “roast duck baguette” I was sold. Sold! Totally drifted during the rest of the explanation – I believe there was a lemon chicken baguette and assorted varieties of sandwiches as well. A lot of bang for your... duck? The bread is apparently from The Convent Bakery in Abbotsford. I need to get myself up there sometime soon. So pleased were we with our duck baguettes, that we ordered ourselves some sweet treats for lunch-dessert: passionfruit slice and apple crumble. We may have started gouging into this before the photo was taken. 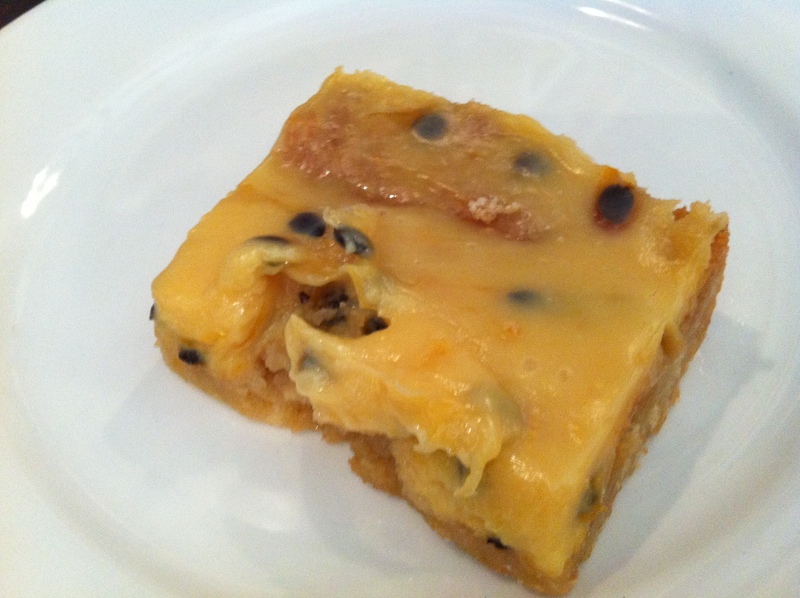 Halved and shared, the passionfruit slice was the clear winner on the day due to the zingy passionfruit flavour and the amazing base – chewy yet coconutty! However, the apple crumble was just $1.50 and a strong contender in the value equation. Still a contender, but outclassed on the day by the slice. Actually, that’s true of everything Oli & Levi are selling – it’s cheap as! 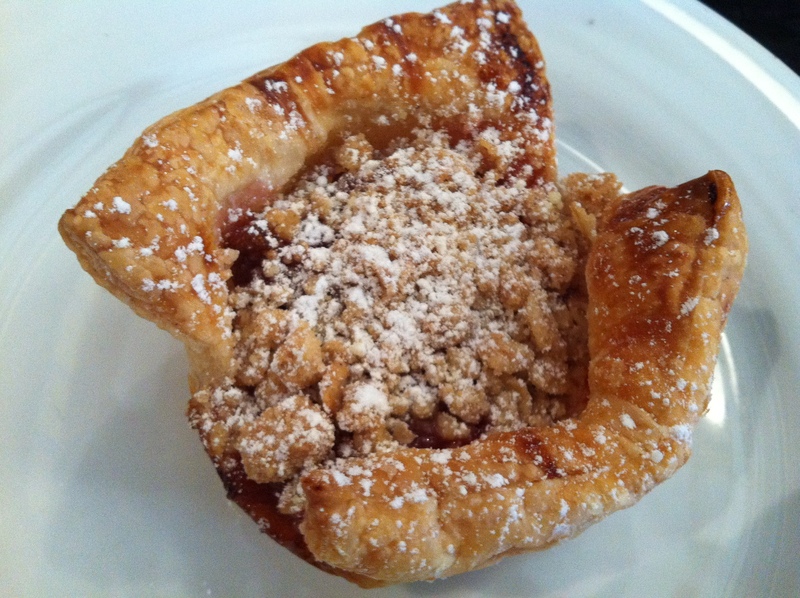 A coffee and a sweet treat (like the aforementioned apple crumble) will give you change from $5. We had (unpictured) coffees with our lunches as well as lunch-desserts, and total cost of our meal was $15 each. What other place up the so-called Paris end of town will do that for you? To list Oli & Levi’s attributes, which has only been open for two months: staff are lovely, prices are fair, coffee is great, food is amazing. Oh and it’s down a lane, so tourists will feel special for discovering it. As will bored officeworkers such as ourselves. It’s always interesting looking up other reviews after you’ve written your own and see what points you differ on. As they’ve only been open for a couple of months, I’ve only been able to find the Agenda’s review and Milk Bar Mag’s review, which I agree with in its entirety! 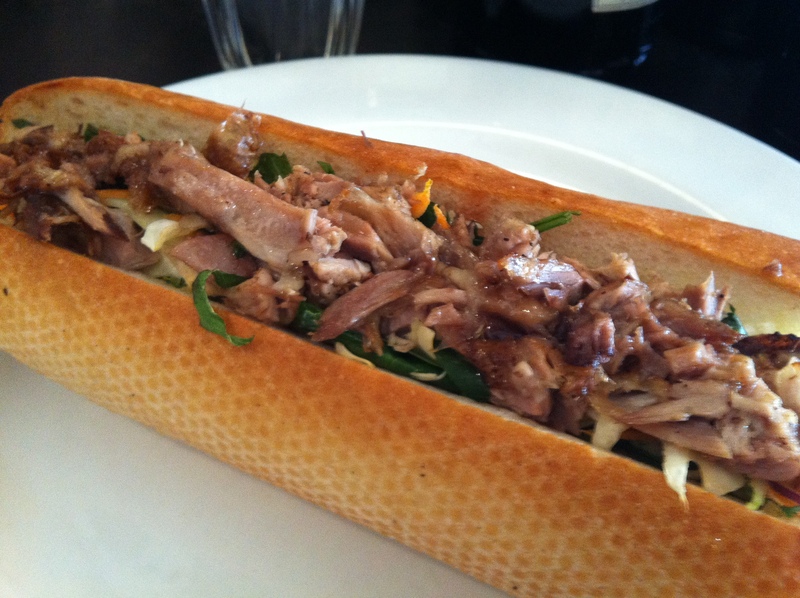 Tags: cheap eats, coffee, duck baguette, laneway, work lunch. Bookmark the permalink.